How expensive is your commute? 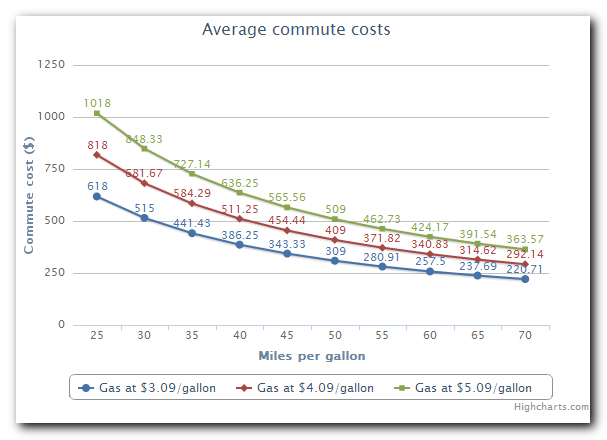 When gas prices were sky high I was curious how much more my daily commute cost. I also wondered if it would make financial sense to get a more fuel-efficient car. To use it, enter the distance of your commute (one way), your car’s average gas mileage, and how much gas costs in your area. You’ll see a graphs of your actual costs, along with how your costs would vary if you got better gas mileage, and if gas cost another $1 or $2 a gallon. In the end, my commute costs weren’t high enough to justify making any drastic changes. Give it a try and see what your commute is costing you.